One of my favorite things is when my family and I visit the children in the hospital. We bring them food, such as sandwiches and bananas. We sing to them and have worship with them. The kids really like it when we come to visit them. The Papua New Guinea Union Mission (PNGUM) was organized in 1949 and reorganized in 1953 and 1972. With 240,205 Adventist members, the PNGUM has the highest membership of any territory in the South Pacific Division. There are 962 churches and 2,852 companies within the PNGUM. My name is Kelthon and I live in a place called Lae in Papua New Guinea (PNG). I’m 5 years old and I love to go to Sabbath School. I also really like to help people. One day my daddy, cousin, and I were walking down the street near my house. As we were walking, we saw a blind man standing by the road and asking for money. I felt sad and told the man that I felt sorry for him, but I didn’t have any money. So I asked my daddy if he would give me some money. Daddy asked me, “If you had money what would you do with it?” I told him that I’d give it to help the blind man. My daddy gave me 5 kina (that’s the name of the money in our country). Then I went to the blind man and took his hand. The man was so surprised, and he smiled. Then I gave him a hug and gave him the 5 kina. He was really happy, and so was I! In Papua New Guinea it can get very hot! Sometimes people work on the road not far from where we live, and they get very thirsty. My family and I like to fill up jars with water and take them to the men working on the road. They are always happy to have a nice cool drink of water. Sometimes on Sabbath evenings my mother and I go to an area of Lae where there are lots of women just standing around. They are hungry, and so we bring them food. We also give them books about Jesus and I like to make cards for them telling them that Jesus loves them. Sometimes the women cry when we give them these things because they are happy to know that we care about them. My parents tell me that one day when Jesus comes, there won’t be any more sickness or sadness or problems such as kids not having enough food or clothing. But until Jesus comes, we do what we can to help people and to tell them about Jesus. 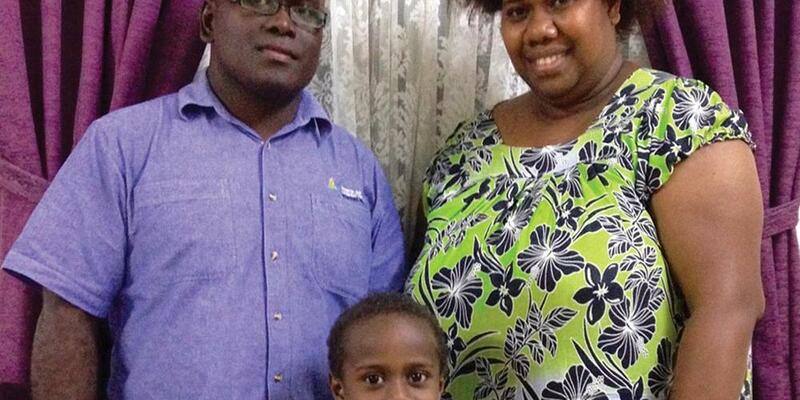 In Papua New Guinea lots of children love to come to Sabbath School. More than halfof the Seventh-day Adventists in PNG are children and youth! But in many places the children just have to sit under the trees for Sabbath School. This works OK when it doesn’t rain, but when it does rain it becomes very muddy and we just go in the church and sit with our parents. A few of the Adventist churches here have places called “lamb shelters” where the children go for meetings such as Sabbath School, Adventurers, Pathfinders, and other things. We really need more lamb shelters for all of the kids here in PNG. Part of the Thirteenth Sabbath Offering for this quarter will help build more lamb shelters for the kids here. Thank you so much for helping us to have a nice place where we can meet together and learn more about Jesus.